“No Pain, No Gain” in Indoor Cycling? This post first appeared in 2014. It has been updated. We’ve all heard the adage No Pain, No Gain. And we’ve all heard the reasons it’s a myth. But we also hear that it’s not possible to really succeed or improve performance unless you learn to suffer at your chosen sport or activity. So what is it? Where is the line drawn? And how should indoor cycling instructors coach? Should we never use words like “suffering” or “this is going to hurt” in our coaching? 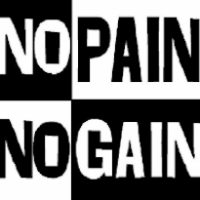 Here is an article from the Fitnessglo blog called The Truth Behind “No Pain, No Gain” in Fitness. Four fitness experts give excellent advice on the topic: Petra Kolber, Michelle Dozois, Amy Dixon, and Denise Klatt. There are different kinds of pain and everyone has a different pain threshold, too. For example, we all (I hope!) know the difference between aching legs from a tough spin class and the sharp, electric pain of a torn muscle. The bottom line? Work on your BODY AWARENESS. One of the best ways to do this is through your breath; once you learn to control and monitor your breathing as your body moves, you’ll be much more present, physically. It might sound strange, but many of us just “check out” when we’re exercising—we just want to get it over with. Try to stay aware and checked in during your routines. Sure, those legs might be aching but rather than trying to escape that feeling, breathe into it. If this seems too abstract, you can start by doing simple breathing exercises while at rest: breathe in for a count of 5, hold for 2 seconds, and breathe out all the way. Try to do this for 5 minutes a day. As you become more aware of your breath, you can start using it to keep you present to all the signals your body may be telling you during a workout. As responsible coaches, we need to teach our riders how to differentiate between pain and challenge. They need to know when it’s a potentially dangerous sensation of pain, such as a torn muscle, and the common and requisite discomfort of high intensity. Pushing through discomfort can lead to big gains in fitness and performance. This is what we refer to as exceeding your comfort zone. On the other hand, pain is where you genuinely hurt. There will be no gain from pushing through this kind of potentially damaging pain. Where is the source of pain coming from? Have you felt it before? If you stop will it go away? Be wary of localized pain (joint, muscle, chest/heart). The bad kind of pain is usually more localized and may not stop when you stop what you are doing. It is often new to you, although with some injuries like knee pain, it may appear every time you ride. Discomfort is not generally localized and it subsides when you stop. You may still breathe hard for a while, but the “pain” of a sprint or short anaerobic effort is fleeting and is no longer there when you ease up. This kind of discomfort is something most people are familiar with, and it is the fear of this “disquieting annoyance” (to use a euphemism) that keeps some people away from exercise, especially hard exercise. It is a kind of “pain” that we have complete control over—just don’t do it! What we need to ask ourselves, and inspire our riders to ask themselves, at what point does that avoidance get in the way of advancing our progress towards our fitness and weight loss goals? It’s important that we find out enough about our new riders to know if they are totally new to exercising or returning after a long period of inactivity. These individuals may not be aware of those differences between pain and discomfort and/or they will need to have their hand held as you gradually progress them through several weeks or months of training. A newbie will have a much lower threshold of discomfort than a longtime rider. To that new exerciser, almost any discomfort is “painful,” even though you know it won’t necessarily hurt them. These riders need to be nurtured and encouraged. Early on in their acclimation to your cycling classes, you should err on the side of being overly conservative in your coaching. They will gradually be able to handle longer periods of time in the saddle and higher intensity with less discomfort. Essentially, you are helping them to push the walls of their comfort zones further away. For these riders, avoid using terms like “push through the pain” or anything about “suffering” until they have a good level of fitness and can differentiate pain from discomfort. However, it is still our job as coaches to help them eventually discover and then exceed their own comfort zones if we want to guide them to the joys that fitness offers. 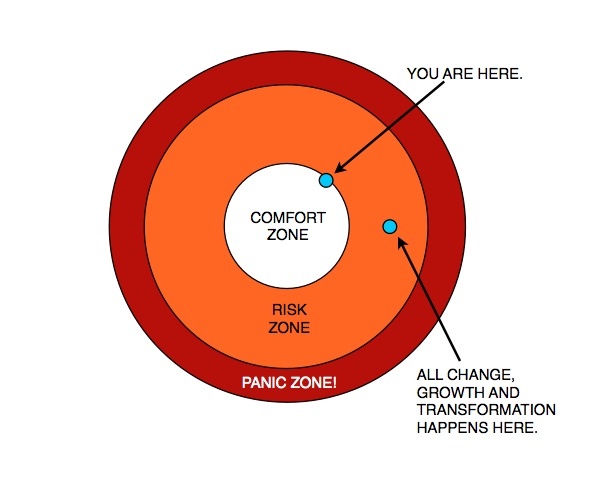 The graphic below shows that exceeding one’s comfort zone is where all growth and transformation lies. Note that there exists an outer rim called the “panic zone” that could entail injury. That is where the “pain” lies and a skilled coach will guide riders to understand their bodies well enough to know when they are too close to that outer rim. This graphic will be different for each individual. Becoming more familiar with the “risk zone” (where transformation happens) is best done with what I like to call “guided excursions.” Do it in short periods with a prescribed number of visits, so they always know they won’t be too far away from what is comfortable and that they only have a few more “challenging” times left before they can settle back into their comfortable place. Increasing the length and quantity of those excursions outside of their comfort zones is how you help them narrow the risk zone and push that outer rim further away. Caution! Take them there too quickly and for too long, and you might lose a rider for good. What about the more advanced rider and “pain”? As an instructor for close to fifteen years now, having taught in numerous clubs, I find this issue so important that I continue to emphasize the importance of “smart cycling” in all of my classes! Listening to your body, your frame of mind, your current health etc. is so important in making the difference between a good and healthy workout, or possibly hurting yourself. “Pain” and “hurt” are word I’ve never used in my class. I haven’t deliberately left them out, I just use a different approach in coaching. I train to perceived intensity, allowing each person to decide what each specific intensity feels like. I explain at the beginning of every class that the first 2 zones are on the comfortable side of the spectrum: easy and moderate. But zones 3 and 4 are on the uncomfortable side, zone 3 being hard- huffing and puffing, heart pounding, officially not happy with the effort…but you can still talk if you have to. One or two words. And then zone 4 is the sprinting/breathless zone. No talk!! Extremely uncomfortable! Every single class, I do a Tabata drill. I figure, the initial research was done on stationary bikes so why can’t we play?! I tell my class that this segment is the hardest I’m going to ask them to work, push as hard as you can. But again, although I’m asking you to push way beyond your comfort zone, PLEASE listen to your body and do what YOU can do. However, recognizing “pain” (i.e. something is “wrong”) versus “discomfort” (i.e. “yuckiness”) certainly may be due to poor technique and/or set up. But if the rider isn’t taught to be self-aware, they may never find out that their technique or set-up is wrong. That is YOUR job as a coach! Teach them how to ask questions of their bodies. If something feels wrong, help them to feel comfortable enough to ask you to look at their set up or their form. Great article Jennifer Sage, as always!! I teach on an Army post, and as a Marine veteran, I know too well the phrases, “No Pain, No Gain,” and the Marine Corps likes, “Pain is weakness leaving your body.” The military teaches/brain washes our Soldiers/Marines/Sailors to push past the pain and keep going. In some instances, combat, that is necessary. But in our classes it’s not. I tell my classes all the time, “I am so past the whole ‘No Pain No Gain” thing. The Army already destroys your body, this class is NOT meant to do that.” I explain that I want “DISCOMFORT,” NOT pain. I want INTENSITY. I explain, pain is that searing pain in your joints, in your hips, your knees, ankles, it’s your body telling you SOMETHING IS WRONG, and to always listen to your body. I explain discomfort, pushing past that cozy comfort zone, is where change happens. I love this article. It reinforces all that I promote in my classes. Thank you!! I’ll be sharing this article with my indoor and OUTDOOR cyclists!! Ride On! Christine’s line would be a good addition to Cuez. It sure would! I’m scheduling it for the next release the first week of january! Thanks! I should add that in the Cuez coaching app, we do have a subcategory of the “Intervals and HIT” and “Climbing” categories entitled “Suffering”. I believe every instructor should know how to correctly cue the intense aspect of cycling/indoor cycling, and the cues in this app can help every instructor learn how to intelligently guide riders to that level of challenge. Or look up Cuez in the Apple store on iTunes. (Note, if on an iPad, make sure to select iPhone app in the dropdown. It will still work on your iPad, but Apple calls it an iPhone app). In answer to your general question. I don’t push my riders to work hard – they do that for themselves. From the first time I meet them I tell them that the workout is all theirs and that I will merely be offering suggestions. I go on to tell them that their definition of ‘hard’ and ‘fun’ will change over time and I am there to support them no matter where they fall on that curve. I probably spend more time explaining the advantages of working at sub-maximum effort and of recovery. I deliberately do not use words like ‘hurt’ or ‘suffer’ because I almost always have mixed classes. My favorite descriptor of the difference between appropriate discomfort and inappropriate pain is: Does it feel yucky or does it feel wrong? That language takes away loaded terms like pain but still conveys that there is always a decision to be made. Christine, that’s my new favorite line: does it feel yucky or does it feel wrong? I think that may be the best way I’ve heard to get them to truly understand the difference. Thanks for a great way to describe it to our riders! thanks to Christine, “Does it feel yucky or does it feel wrong” will be a new and clear way of helping our riders understand the difference appropriate discomfort and inappropriate pain. This is a great phrase to give our riders that they can take with them when they are riding elsewhere with those not following a Keep It Real philosophy so they can make quick decisions. BTW, where are you located Christine? I’d loved to experience your classes and also give you and your classes as a referral to my riders that travel out of town. I’m a long way from you, Renee. I am a transplanted American now living outside of Halifax, Nova Scotia. I teach at the St. Margaret’s Centre, a community facility in Tantallon. For the few who have been to Nova Scotia, we are fairly near Peggy’s Cove. I’d love to see ICA members and their friends in my classes but realistically realize it’s pretty unlikely. Hi, I’ve only been teaching spin for 6 months, but have been a participant in spin classes for several years. I’ve never been so passionate about any other sport that I’ve coached or taught. I live and dream spin. I push my class to the max and tell them this at the beginning of the class with a caveat that it is their class, however when you come to my classes, expect to work. My classes are high intensity interval training.. Never going over 110 Rpms, with combinations and drills targeting intense wattage or speed. And my music aligns with my drills.